Entwined with this anxiety is a misplaced conviction that bottles age toward a momentary peak, then drop away into oblivion. Opening a bottle at the wrong time, many believe, risks missing that special moment. Too often, I've seen people unable to enjoy an otherwise delicious bottle of wine because they have convinced themselves that they missed the peak. Here is the good news about aging wine: Regardless of what many people assume, there is no single right time to open any particular bottle. Whenever you decide to drink a wine is the right time. If you go about it the right way, it's hard to make a mistake. First, it's important to understand that wine does not age toward an apogee of development, then drop off. Bottles that can improve with aging tend to move along a gentle arc, during which they will offer many delicious expressions, from youthful exuberance to middle-age complexity to eventual fragility. It was almost 10 years before I opened the second bottle, but wow, was it delicious, deep and complex yet still youthful. This wine has a long way to go, and I'm delighted to have four bottles left. If you do plan to age wine, it's important to have proper storage. A cool, dark cellar, free of vibrations, is ideal. So is a million dollars to fill the cellar. If you have a cellar, but it doesn't keep the ideal 55 degrees year round, fear not. Temperature variation is not terrible, as long as it does not get too warm. Except for very old vintages, wine tends to be sturdier than we think. This was the conventional wisdom, at least, when much of the Beaujolais and Muscadet was made cheaply for mass consumption. With all the processing these wines received, the wines' vital life forces were stripped away. Of course, they needed to be drunk young. With more time, they fell apart. I don't dislike aged Muscadet: It can be wonderful, and some people like it better that way. But I've concluded that I prefer it younger. I love young Beaujolais, too. But I recently opened a bottle of Daniel Bouland Morgon Vieilles Vignes 2005, and it was beautiful, silken and earthy, with an aroma of violets. I haven't had this wine in maybe 10 years, so I don't know what I missed along the way, but it sure is good now. In their youth, they can be vivacious and floral, with a pleasant mineral edge. When they are older, say, 10 years old for a St.-Joseph and 20 years for a Hermitage, they can be gorgeous and, in the case of Hermitage, transcendent. In between? Too often, I've had white Rhônes that just seemed dull, as if they were cocooned or hibernating. This transitional time between energetic youth and mature complexity is sometimes called a dumb phase. It's an irritating notion because it's difficult to know when it begins and ends. But it's also reassuring, as it indicates that the wine is alive and not a denatured, shelf-stable beverage. Luckily, I don't see this in too many other wines nowadays. Perhaps more difficult than knowing when to open a bottle is initially judging its aging potential. Track records help to form general estimates.Aging estimates for wine genres are not hard to find on the internet or in wine textbooks. I'm not sure I'll be around to judge. But I'm pretty sure I will have had many happy experiences with so-called lesser vintages in the meantime. 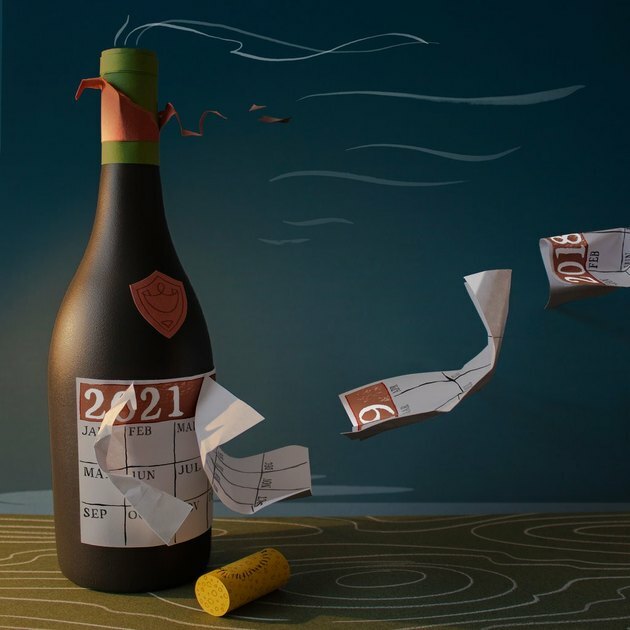 Historically great wines Burgundy, Barolo and Bordeaux are obviously age-worthy, but not equally so. Vintage conditions are crucial, and so is the style of each producer. The internet and guides like Hugh Johnson's annual Pocket Wine Book offer good general estimates by vintage of aging capabilities. Price It is sometimes a good indicator, but only when you are comparing a bottle within its genre. A $25 Chianti Classico is likely to age better than a $10 bottle. But the price equation does not always work. I've had $100 Napa cabernets that aged far better than more extravagantly priced Napa cult wines. Wines that shouldn't be aged Mass-produced, processed wines are made to drink as is. Similarly, artisanally produced, thirst-quenching wines, sometimes called by the French phrase vins de soif, are made to offer immediate pleasure. They, too, will not get better with age.